This 3"x5" size pocket booklet contains the procedures to stop a heart attack with your hands and more. It does not contain the extra information and instruction of the EMT manual, but is an easy to carry anywhere reference guide to every procedure in the EMT manual. Plus, this booklet includes an additional application from the TKM® Volume 3 Textbook for critical and emergency situations. This is a vital resource to keep on hand for people at home or for police and other emergency responders. Many organizations are already using these proven procedures for years. Know how to stop external or internal bleeding without the aid of a compress. This 22 page E.M.T. booklet provides vital TKM® procedures for critical moments like these and other emergency episodes. Included are common family and household uses. These emergency procedures are in easy-to-follow illustrations. 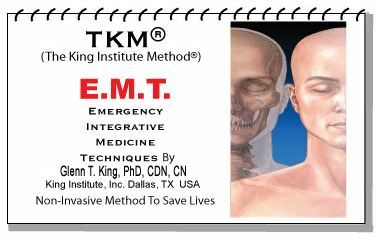 To learn more about the TKM®: Emergency Integrative Medicine Techniques (EMT) course, visit the Education page. © 2009 Glenn T. King, PhD, CDN, CN All Rights Reserved.